On Wednesday, following rapid rise, the British currency rolled back to the level of 1.5290. After that, due to the lack of fundamental economic releases, the pair traded with low volatility. This morning the pair went up to the level of 1.5380 due to anticipation of the data on British GDP. However, all of a sudden, the pair went down despite positive statistics. The pair GBP/USD has reached the level of 1.5300. Attention today shall be paid to the US macroeconomic news, including the most important one — unemployment claims. After the unexpected fall of the pair down to support level at 1.5300, it is likely that the pair will rebound and reach resistance level of 1.5400 and after that will go up to the new local highs. According to experts, today’s data on US labour market is going to be negative, which may push the pair up. It is advisable to place long positions at current price with profit taking at the level of 1.5400. 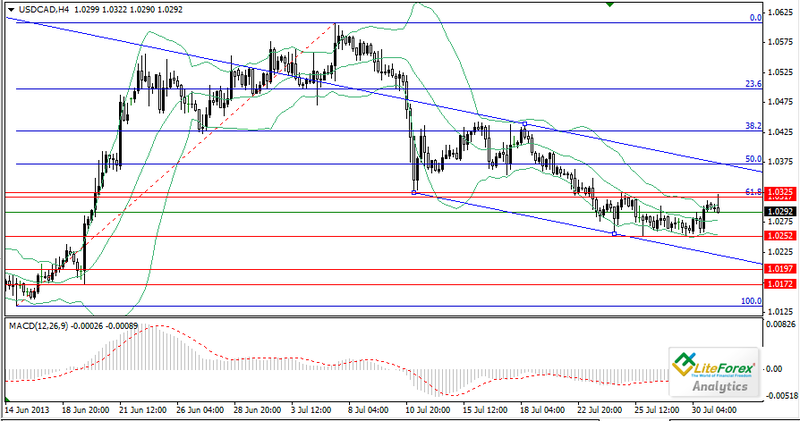 In the medium-term it is recommended to take profit at the level of 1.5470. On the four-hour chart MACD histogram is in the positive zone above the signal line and is directed upward, indicating continuation of the ascending trend. At yesterday’s trading session the pair USD/JPY strengthened due to the US news. Preliminary business activity index in the US manufacturing sector amounted to 53.2 points in July, while sales of new homes increased by 38 thousand in June. However this morning the pair started to weaken, dropping to the 99.80. The Yen has strengthened because amid overall weakening of the Asian markets, investors used JPY as a safe-haven currency. Currently the pair traded near support level of 99.80, which coincides with the moving average line of “Bollinger bands” indicator, and looks like the key one. If the price breaks down this level, the pair may go down to 99.20 and 99.00. Otherwise the growth may reach the level of 101.00. Note that on Friday morning the data on basic index of consumer prices in Japan for July will become known. Experts expect that the index can amount to 0.3%, which can lead to the weakening in JPY. In the current situation short term short positions can be opened if the price consolidates below the level of 99.80. However long positions are more relevant and they can be opened from the level of 100.00 with profit taking at the level of 101.00. On the four-hour chart “Bollinger bands” indicator does not demonstrate convergences and is in the sideways trend. The price chart is near the moving average, but cannot break through it. MACD histogram is in the overbought zone, however soon it may move to the oversold zone again. 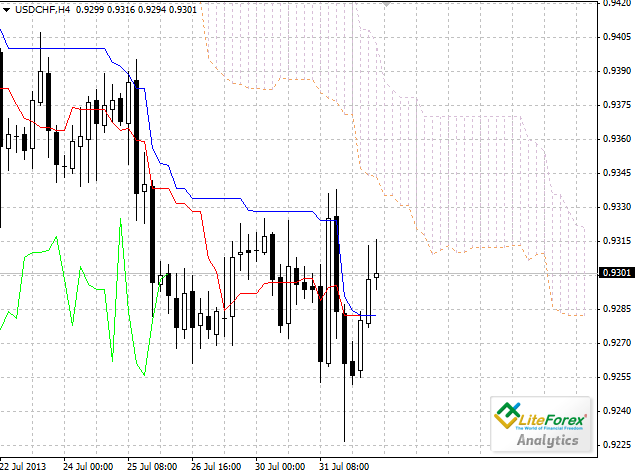 The lines of Stochastic are directed downward, giving a signal for temporary downward movement in price. On the four-hour chart Tenkan-Sen line is below Kijun-Sen, they are both horizontal. Chinkou Span line is below the price chart, current cloud is descending. After long fall this week the pair has slowed down. The nearest resistance level is Tenkan-Sen line at 0.9331. 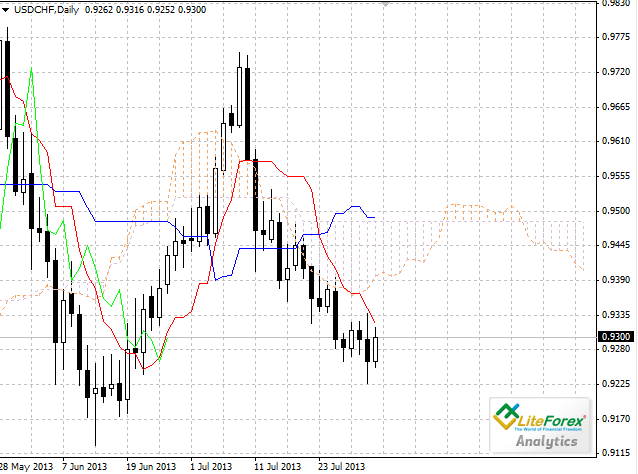 One of the previous minimums of Chinkou Span line is expected to be a support level at 0.9267. Let’s look at the daily chart. Tenkan-Sen line has crossed Kijun-Sen line from above. The price chart was able to consolidate below the lower border of the cloud and continue to go down. Chinkou Span line is crossing the price chart from above, current cloud is descending. The nearest resistance level is Senkou Span A line at 0.9366. One of the previous minimums of Chinkou Span line is expected to be a support level at 0.9200. On the four-hour chart we can see a slow-down of the downward movement. However all Ichimoku lines on the chart of the higher timeframe indicate the development of “bearish” trend. The target for the long-term sell positions is 0.9200. As expected the British currency was volatile on Thursday. In anticipation of positive data on British GDP investors started actively buy the Pound, bringing it up to key resistance level of 1.5400. The data on GDP has agreed with the positive forecast; however the pair sharply went down, which was triggered by overvalued expectations of investors. Despite favourable British macro-economic statistics economic growth is still below pre-crisis level of 3.3%. After significant decline in the pair investors and traders continued to actively buy the British currency. 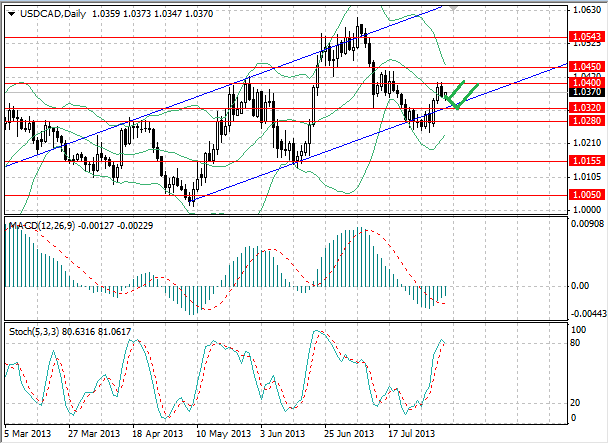 High demand and positive economic data provided support to the pair and GBP/USD soared up to the new local highs. 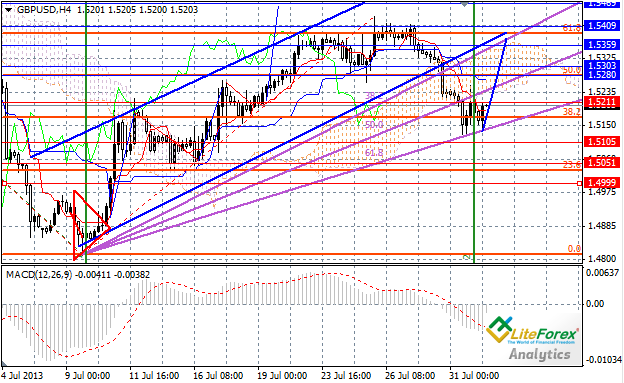 Based on the positive wave the pair reached the level of 1.5430 and after that rolled back to the level of 1.5400. Economic calendar is uneventful today, so the pair will trade with low volatility. 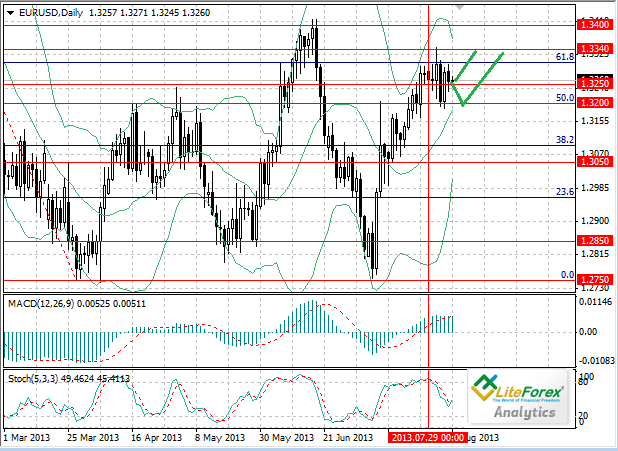 Today, based on the high demand for the Pound the pair can consolidate above key resistance level of 1.5400. 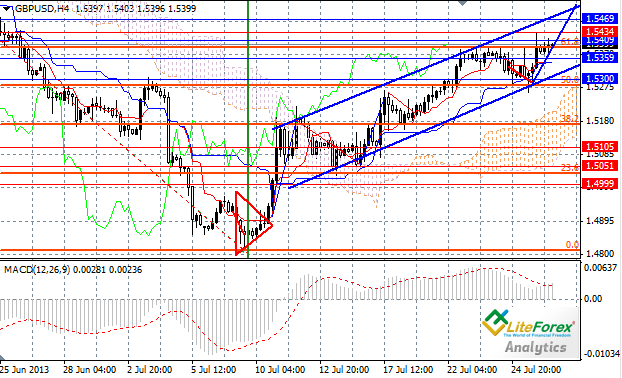 Later ascending trend is likely to continue up to the new local highs of 1.5470 and 1.5570. 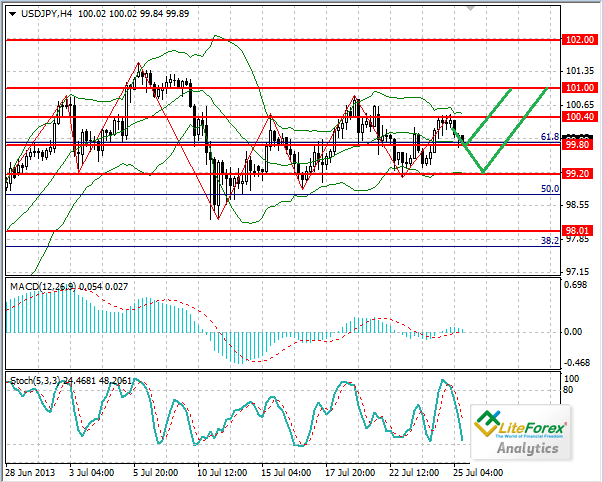 Reputable analysts believe that in the medium-term the pair will reach the level of 1.5750. In the current situation it is advisable to place long positions with profit taking at the level of 1.5470-1.5560. On the four-hour chart MACD histogram is in the positive zone above the signal line and is directed upward, indication that ascending trend will continue. Let’s look at the four-hour chart. Tenkan-Sen line is below Kijun-Sen line and they are both horizontal. Chinkou Span line is below the price chart, current Kumo-cloud is descending. The pair has slowed down its fall and is trading now along Tenkan-Sen line, which is resistance level at 1.0280. One of the previous extremums of Chinkou Span line is expected to be a support level at 1.0195. On the daily chart Tenkan-sen line is also below Kijun-sen. Chinkou Span line is crossing the price chart from above; current Kumo-cloud is ascending. After long fall the pair has entered the cloud. Upper and lower borders become resistance (1.0312) and support (1.0249) levels respectively. 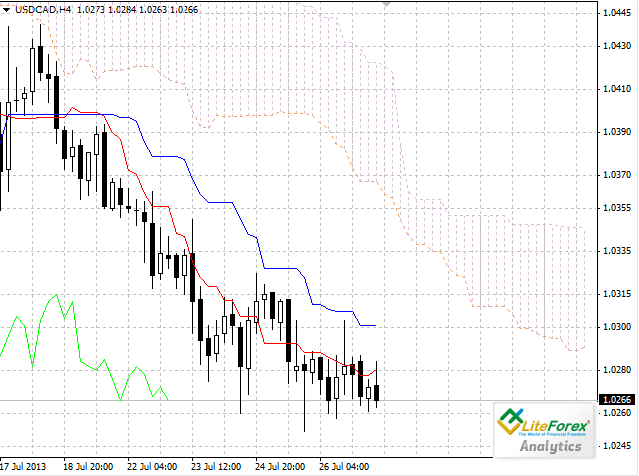 If the price breaks through lower border of the cloud, the next goal for the Bears will be at 1.0155. Support levels: 1.0249, 1.0195, 1.0155. On the four-hour chart the price has slowed down, but we expect a new “bearish” impetus. 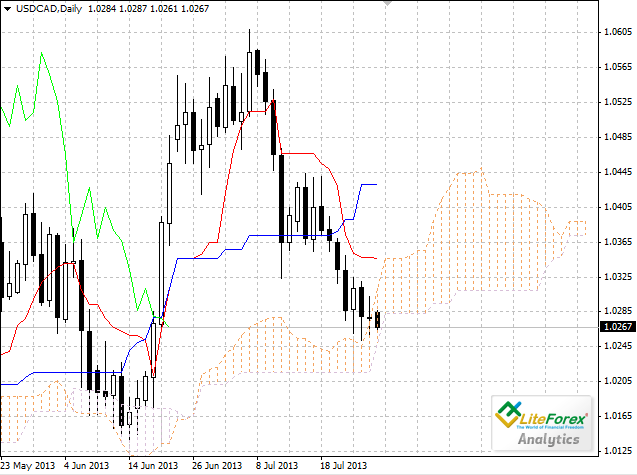 On the chart with higher timeframe the price has entered the cloud but its volume is less than 100 pips. Considering confirmation sign from the Chinkou Span line we would recommend to open short trades with targets around 1.0155. At the end of last week the British currency continued to sideways correction in the narrow channel near the level of 1.5400. The pair has repeatedly tried to break down key resistance level and consolidate above it, however all of these attempts failed. Today the pair will continue to move in the narrow range of 1.5405-1.5360. Positive data on the mortgage loaning was not able to add momentum for the further rise in the pair. At the moment investors are waiting for the fundamental statistics on the US construction sector, showing number of pending transactions on selling homes. Volatility is not expected to be high today. The pair will continue to move slowly near the key resistance level of 1.5400. 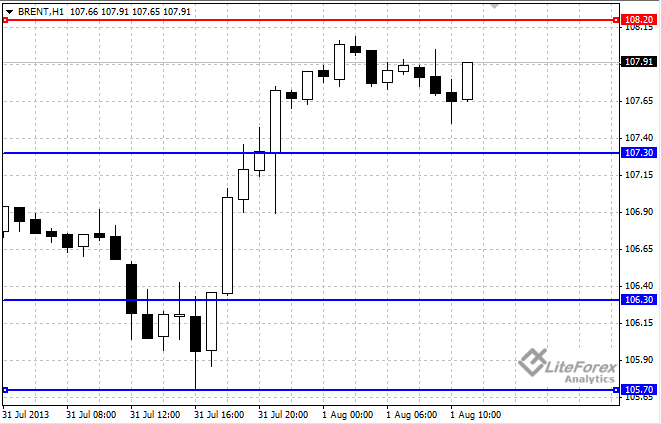 There is a high chance that in future the pair will continue to grow up to resistance levels of 1.5530 and 1.5600. In the current situation it is advisable to place long positions with profit taking at the level of 1.5470-1.5530. In addition it is also advisable to place pending long orders from the level of 1.5360-1.5300 with profit taking at the level of 1.5600. On the four-hour chart MACD histogram is in the positive zone above the signal line and is directed upward, indicating that ascending trend will continue. USD/CAD: which GDP is higher? 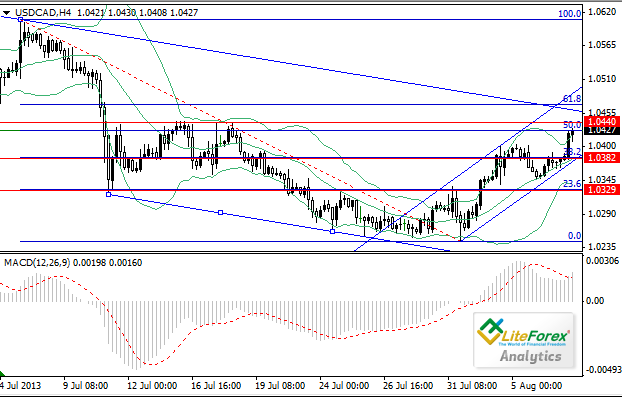 Last week the pair has been trading within a sideways channel with the borders at 1.0252 and 1.0320. The price went down under 61.8% of Fibinacci lines and hasn’t been able to overcome it since. If we look at the whole chart we will see an end of the correction and further “bearish” movement. American economy doesn’t give any hope to investors lately, and it surely affects American dollar. Today we anticipate GDP data from Canada and USA, which can strengthen Canadian currency against American one. Experts predict the rise of the Canadian GDP rate by 0.2% and decrease of the US GDP from 1.8% to 1.1%. Bears can also take profit from decrease of Non-Farm Employment rate. The resistance line is the level 61.8% of Fibonacci lines (1.0317). Support level is lower MA of Bollinger Bands at 1.0252. I would recommend to sell at the current price with targets at 1.0252. If the price consolidate under this level, further movement towards 1.0917 will be possible. Stop Loss orders should be placed at 1.0325. Current situation is ambiguous. On the one hand, indicators of the Japanese labour market are improving, on the other hand, index of industrial output and household spending are showing negative results. The US consumer confidence index was below forecast. At yesterday’s trades the pair had fallen to the level of 97.75, but later regained up to 98.30. Today bears are testing support level of 97.75 again. Investors view uncertainties in the future of the pair and believe that a lot will depend on the American session. The more negative news will be published, the deeper the pair USD/JPY will fall. The nearest support level is 97.70, which coincides with the level of 50.0% Fibonacci line and prevents further decline in price. If this level is broken down, next target of the bears will be the level of 97.00. Resistance levels are 98.00, 98.20 and 99.00. At the moment it is not advised not to enter the market but rather wait for the clearer signals. At yesterday’s trading session Brent significantly rose in price, despite recent fall to the level of 105.70, which were the lows of the last four weeks. The rise was triggered by the US macro-economic statistics. According to the released data US GDP increased by 1.7% in Q2 2013, which was above analysts’ forecast, who expected the rise of only 1%. At the same time Brent has also strengthened due to technical purchases, caused by the decline in rate. Although recently released data on oil inventories was below experts’ expectations, this fact did not put significant pressure on the Brent rate. Over the past week commercial crude oil inventories in the US increased by 400 thousand barrels, gasoline inventories rose by 800 thousand barrels, while analysts had anticipated significant decline in oil products. Today Brent rate is supported by the data from China, the second largest oil consumer. Business activity index PMI in China rose to the level of 50.3 points against the forecast of 49.8 points. This data indicates positive dynamics in the manufacturing activity in China, thus, increasing optimism among investors, who worried about slowdown in the economic growth of China. 17:00 (GMT+3) Business activity index in the manufacturing sector estimated by the Institute for Supply management (ISM). 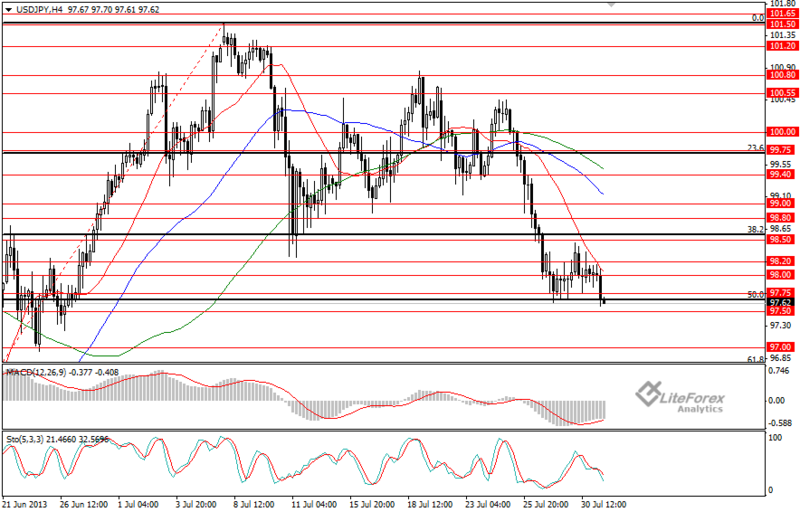 Support levels for Brent are: 107.30, 106.30 and 105.70. Resistance levels: 108.20 and 109.00. On Wednesday the British currency was under pressure due to the decreasing demand for the pound and favourable US statistics. The data released yesterday showed that the US GDP rose by 1.7% in Q2, which was above the forecast. The USD received support and the pair dropped to the level of 1.5130. to In response to the news that the US Fed left interest rate at the previous level, the pair GBP/USD rapidly went up to the level of 1.5250. After that the pair resumed slow decline. Today the pair continued to decline and reached the level of 1.5130. Later, in anticipation of important publications on British economy investors started to buy the Pound and the pair went up. Index of manufacturing activity, as per PMI estimates, has exceeded the forecast, giving additional support to the pair and it reached the level of 1.5200. However, the main news is yet to come: this afternoon the Bank of England will announce key interest rate and will make a decision on the volume of asset purchase program. 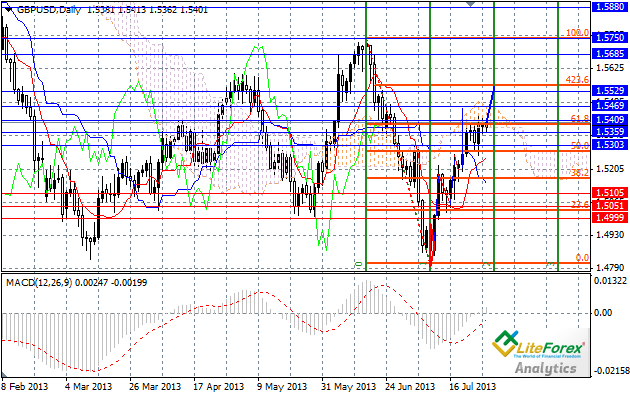 Today the pair has consolidated above the key resistance level of 1.5160. In future a lot will depend on the speech by the head of the Bank of England, Mark Carney. Amid economic stabilization of the past several months, the pair can receive considerable support. In the medium-term the pair is likely to reach the level of 1.5300 and go further up to the recent local highs of 1.5400 and 1.5450. In the current situation it is advisable to place long positions with profit taking at the level of 1.5300-1.5400. On the four-hour chart MACD histogram is in the negative zone below the signal line and is directed downward, indicating either downward correction or the beginning of the downtrend. On the four-hour chart Tenkan-Sen and Kijun-Sen lines are merged and stay horizontal. Chinkou Span line is crossing the price chart from below, current cloud is descending. The pair has consolidated above Tenkan-Sen and Kijun-Sen, which became the nearest support at 0.9283. The next obstacle for the price on its way up will be the lower border of the cloud at 0.9335. Let’s look at the daily chart. Tenkan-Sen line is below Kijun-Sen line, the red line is directed upwards, while the blue one remains horizontal. Chinkou Span line has crossed the price chart from above, current cloud is descending. The nearest resistance level is Tenkan-Sen line at 0.9321. One of the previous minimums of Chinkou Span line is expected to be a support level at 0.9200. On the four-hour chart we can see a development of trend reversal. Long trades can be opened at the current price with Take profit orders around 0.9335 level. Daily chart doesn’t confirm trend reversal. The target for the long-term sell positions is still 0.9200. A lot of important data on British and American economics has been released at the end of this week, which increased volatility in the pair. Yesterday the Bank of England announced key interest rate and volume of asset purchase program. The indices remained at the previous levels, so the release of this data hardly had any effect on the movement in the pair. Later, the Pound got support from the strong data on index of manufacturing activity, which demonstrated growth to the level of 54.6, exceeding all forecasts. The pair soared up to the level of 1.5240. However, after the release of data on labour market and index of business activity in the USA the pair went back to support 1.5100 and consolidated near this level. Attention today shall be paid to Nonfarm Payrolls and unemployment rate. In addition, the data on personal spending, basic price index for private consumption spending and manufacturing orders will be known today. In the last few days the USD has been actively regaining positions, while the pair GBP/USD has already lost more than 300 points. Fundamentals to be published today will be of importance. If unemployment rate remains at the previous level and a number of jobs excluding agricultural sector drops, the USD will go down significantly. UK has been showing positive economic statistics since the beginning of the year, which indicates the economy of the country is gradually recovering. The pair is likely to grow later, amid weak data on the US labour market. On the four-hour chart MACD histogram is in the negative zone below the signal line and is directed downward, indicating either descending correction or the beginning of the downtrend. Yesterday’s macro-economic data was above analysts’ forecast. Number of announced corporate layoffs as well as number of applications for unemployment benefits was below expectations. Business activity index rose up to the level of 55.4 points. This fact provoked the decline in quotes: the price went beyond the lower limit of the channel; however the American currency did not continue strengthening. 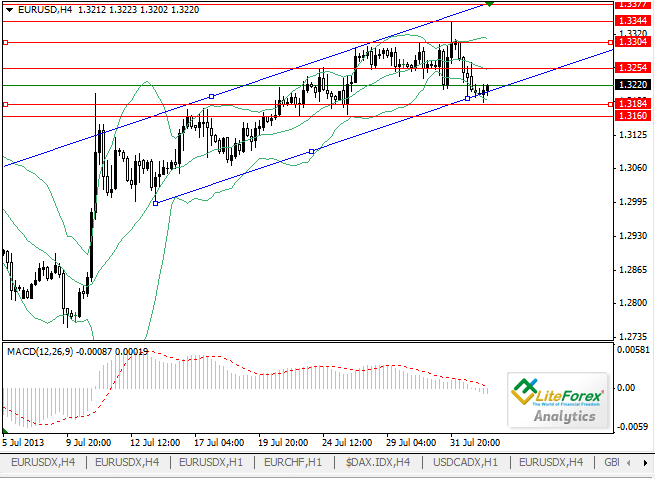 Today, the pair traded at the level of 1.3220, due to technical support from the lower limit of the channel. Further movement will be determined by the economic data, scheduled for the release today, including: number of jobs excluding agricultural sector, unemployment rate, average hourly earnings and consumer spending. Expected reduction in unemployment rate will hardly provide support to the USD amid anticipated decline in jobs by 9 thousand, cuts in people’s income and the rise in spending. Based on the indices’ performance, investors will be able to decide whether measures taken by Federal Reserve in respect to the quantitative easing program have been efficient or not. The first important resistance level is 1.3254, next one is 1.3304. Support levels are 1.3184 and 1.3160. In anticipation of the negative performance of the US economy I would recommend to open long positions with the target of 1.3304. Stop-loss can be placed at the level of 1.3160. If the price exceeds resistance level of 1.3254, it will make sense to move stop-loss in the black zone. Analyst of LiteForex Group of Companies. Let’s look at the four-hour chart. Tenkan-sen line is above Kijun-sen line, and they are both horizontal. Last Friday gold went up and entered the cloud once again. Chinkou Span line is below the price chart, current Kumo is descending. The closest support level is Kijun -Sen line (1310.92). Resistance level will be at the upper border of the cloud (1326.83). On the daily chart Tenkan-sen line is above Kijun-sen, and the price is between them. Chinkou Span line is above the price chart, Senkou Span A and Senkou Span B lines are moving towards each other indicating future cloud reversal. 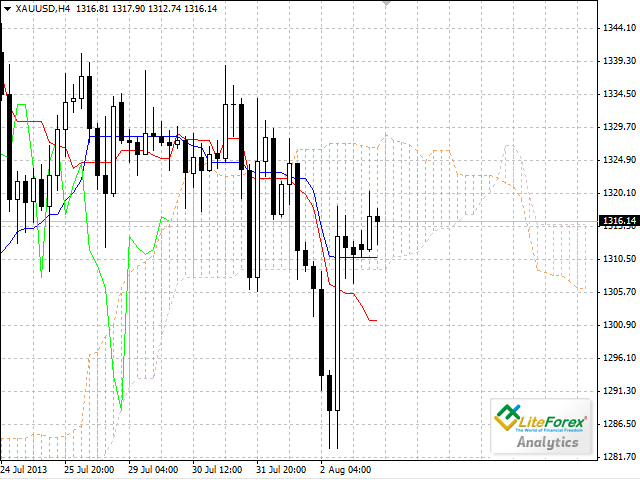 Upper (1333.92) and lower (1292.36) borders of the cloud become resistance and support levels respectively. On the four-hour chart the price has entered the cloud. It is not advised to open new trades. On the daily chart we can see the same situation, the price is moving sideways. Further direction of the movement will be determined by the breakdown of one of the cloud borders. At the end of the last trading week the pair received support from the US macro-economic data. On 2 August statistics on unemployment and the data on nonfarm payrolls have been released. Although unemployment rate fell to the level of 7.4%, a number of jobs outside agricultural sector fell to 162 thousand, which was below experts’ expectations. Market immediately responded to this news by the decline in demand for the USD. The USD rate broke down resistance level of 1.3254 and consolidated above this level. Today the pair went up due to positive statistics on Eurozone: business activity index in the service sector of Spain and Italy rose above all expectations. Attention today shall be also paid to the consumer confidence index in Eurozone, retail sales and index of business activity in the US non-manufacturing sector. 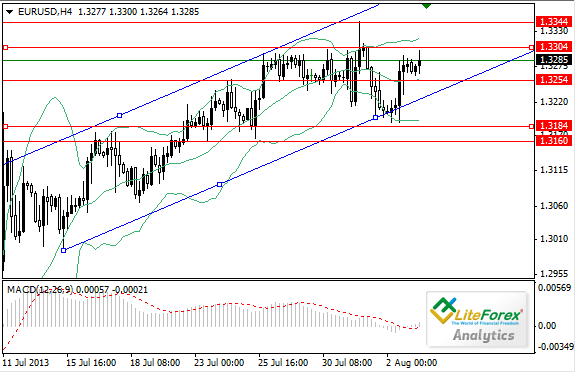 The pair traded near resistance level of 1.3304, which can be exceeded after the release of news from Europe. Next resistance level is 1.3344. Support level is 1.3254. MACD histogram is on the positive zone, the signal line is ready to cross the zero line from below to above. Central line of the “Bollinger bands” indicator has crossed the price chart from bottom to top. Aggregate data of the indicators suggests a chance of the rise in quotes. I would recommend to buy at the current price with the target of 1.3344. Last week crude oil Brent rate significantly dropped under the effect of US macro-economic statistics. By the end of the session the price of Brent was $108.77. Investors were disappointed by the data on the US labour market. Number of jobs outside agricultural sector grew by 162 thousand against the forecast of 184 thousand. It was the lowest index since March. Brent rate was also under pressure from technical sales of oil futures before the weekend, as significant growth earlier gave participants good chances for taking profits. On Monday Brent rate went up, reaching the level of 109.38; however in the result of correction the rate fell to the level of 108.63. Resistance levels for Brent are 109.40 and 110.00. Support levels are 108.30 and 107.60. On Monday the pair USD/CAD rate fell to support level of 1.0360. The decline was part of the correction, which followed after the rise at the end of last week. Today’s attention shall be drawn to the publication of the trading balances in the US and Canada for June. Experts believe that trade balance deficit in the USA will decline, while deficit in the Canadian trade balance will increase, which will trigger the rise in the SD against the CAD. At the moment the pair traded near the level of 1.0360, which actually coincides with the moving average of the “Bollinger bands” indicator. During the day downward movement may reach the level of 1.0320, which coincides with the boundary of the ascending channel. The price is likely to go up to the level of 1.0400. In the current situation it is advisable to open long positions with profit taking near the level of 1.0400. On the daily chart Bollinger lines are directed downward; however the price chart had broken the moving average and moved into the upper band, indicating a chance of growth. Histogram of MACD indicator is in the oversold zone and its volumes continue to decrease. The lines of Stochastic are near the overbought zone (80) and directed upward. In the near future these lines may intersect and shift to descending movement; however a sell signal has not been formed yet. This week the pair EUR/USD started with the decline to 1.3330. Strengthening in the USD is associated with the fact that investors took profit on the short positions, opened last Friday, following the publication of the Non-farming payrolls. Additional support to the pair was provided by the data on business activity index in the non-manufacturing sector of the USA, which rose to 56.0 points in July. Attention today should be focused on the US trade balance for June. According to experts its deficit may be reduced, which can foster strengthening of the USD. 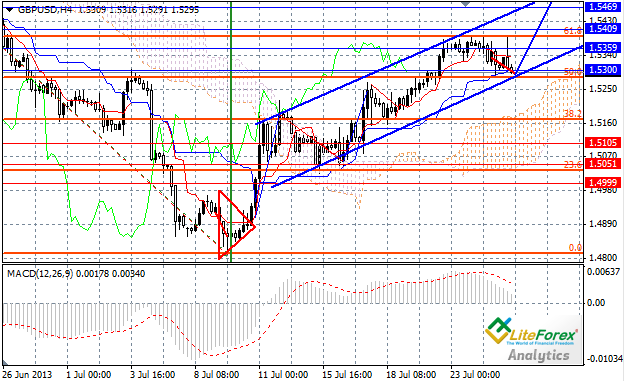 At the moment the pair is testing support level of 1.3250, however it cannot exceed it down yet. If this level is broken down, the price will drop to the level of 1.3200 and from this level the pair may reverse to the ascending movement. 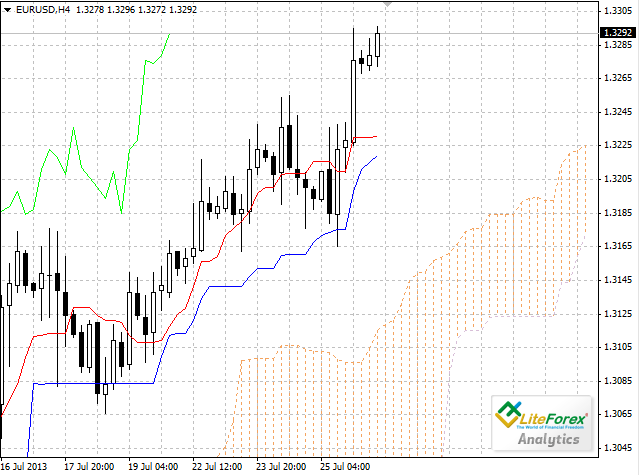 In the current situation short positions can be opened from the level of 1.3250 with profit taking at 1.3200. It is also advisable to place pending orders “buy limit” at the level of 1.3200 with profit taking at the level of 1.3340. On the daily chart bands of Bollinger indicator are directed upward, the price chart is going towards the moving average line, suggesting probability of the decline to the level of 1.3200. MACD histogram is in the overbought zone and it may cross the signal line from top to bottom in the near future, forming a sell signal. On the contrary, Stochastic lines are intersecting, tending upward, indicating a chance of temporary ascending movement. 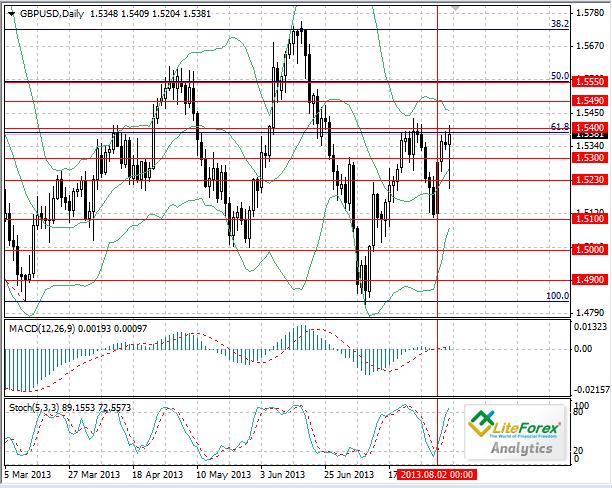 On Tuesday the currency pair GBP/USD fell to the level of 1.5330. Downward movement in price was caused by sharp reduction of the US trade deficit from 44.1 to 34.2 billion USD in June. This morning the pair continued to weaken in advance of the speech of a new governor of the Bank of England Mark Carney. Investors believed that Carney could change monetary policy of the Central Bank of England as he repeatedly hinted. However, Mr. Carney said in his speech that monetary policy of the Bank of England would not be changed until unemployment rate in the country drops to the level of 7.0%. So far the Bank will continue to purchase troubled assets for the amount of 375 billion pounds and interest rates will not be raised. Recall that since last December unemployment rate in the UK has maintained at the level of 7.8%; key interest rate is currently 0.50%. In general, market positively assessed statements by Mark Carney and after the short-term decline the Pound started to grow. At the moment the price is rising to the level of 1.5400 and if this level is broken down, the pair may go up to the level of 1.5490. In the current situation it makes sense to open long positions from the level of 1.5400 with profit taking at the level of 1.5490. On the daily chart the moving average line of “Bollinger bands” is directed upward; the price chart tends to the upper line. Histogram of MACD has moved to the overbought zone, however this fact is not yet considered as a clear signal to buy. The lines of Stochastic are directed upward, giving a buy signal. Today the pair demonstrated rapid rise, correction reached the level of 50.0% Fibonacci. Though there weren’t any important events in the economic calendar that could have triggered this rise. Therefore correction will end soon and «bearish» trend is likely to continue. Canadian statistics will also support the rise: experts expect the increase of the construction permits and the rise of the index of business activity in the manufacturing sector. Forecast for the US economy is not so optimistic: it is expected that volume of consumer lending will drop to 15.4 billion USD; as per the report of the Ministry of Energy oil and oil products inventories will also decline. The pair is trading around strong resistance level of 1.0440, from which the pair will probably go down. It is likely that downward movement will reach the level of 1.0382, where the midline of the “Bollinger bands” indicator is located. I would advise to sell at the current price with the target at 1.0382. The price is unlikely to exceed this level today. Later, the price will probably reach the level of 1.0329.